When it comes to alcohol transportation, flexibility is the key; the laws pertinent to the transportation of alcohol and liquor are constantly changing. A transporter is essentially the middle man between the purchaser and the receiver. Each respective party has a certain set of laws they must adhere to, and the transporters must be aware of all of the state and local area laws. They must also follow an additional set of transportation laws. 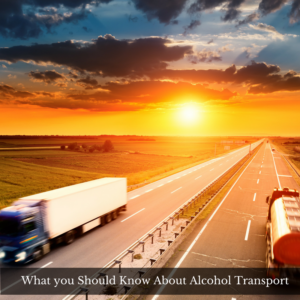 Here are some of the general things you should know about alcohol transport; keep in mind that these facts will vary based on your regional location as well as your state’s individual laws. If you own a convenience, grocery or liquor store, having a liquor license alone may not be enough to allow you to make a bulk purchase of alcohol and have it delivered to your business. A non-retail license may also be required in order to purchase, transport and receive any type of alcohol delivery; the same laws apply for both imported and exported alcohol. The Webb Canyon Act prohibits the transportation of alcohol beyond state lines if there is any violation of law by the receiving state. Some states do not allow the transporting of alcohol at all, and some states will only afford distributors or wholesalers who have a direct partnership with state and local governmental agencies the opportunity to provide any type of liquor transport. Declarations must be made on any alcohol imports, and you cannot sell imported foreign liquor without a Federal Alcohol Administration permit. Since the laws, rules and regulations regarding the transporting of imported and exported liquor, wine, spirits and alcohol are always changing, businesses are always looking for the most inexpensive way to legally arrange for alcohol transport. Bulk shipping methods have exponentially increased in popularity in recent years. With bulk shipping, huge flexibags are placed inside of a large truck and filled with over three tons of alcoholic liquid. Most professional bulk alcohol transportation companies offer a plethora of shipping options. Depending on your local and state governing agencies, your company should be able to take advantage of at least one of these preferred methods of alcohol transportation: tanker shipping, temperature-controlled shipping by refrigeration, flatbed shipping, iso-tank shipping and flexi-tank shipping. Economic growth, stagnation, climate and harvest all impact the availability of alcohol, wine and spirits on a domestic and international scale. All of these contributing factors have an active role in liquor logistics, and this is why small businesses need to be flexible in order to adapt and adhere to the policies and procedures that keep the industry flowing smoothly. As an industry leader in professional liquid and food transportation, Kan-Haul offers clean and safe transportation of a vast assortment of liquid food products in flexitanks and other bulk liquid tankers. We have been a part of the bulk liquid and wine transport business for over three decades. We offer professional and friendly service, and we aim to simplify the hauling process by staying up to speed on the latest laws, rules and regulations of liquid hauling and transportation. Contact us to see how our vast array of transport services can help save you money, time and hassle.